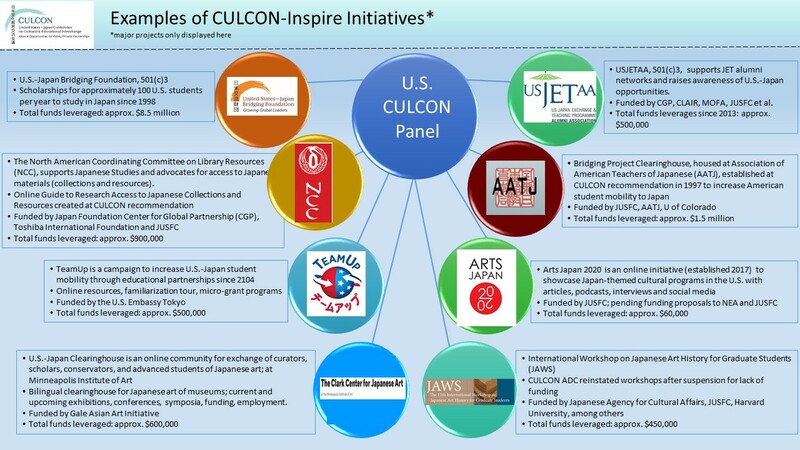 CULCON consists of a U.S. CULCON Panel and a Japanese CULCON Panel, which have equal leadership roles. The panels collaborate to identify and prioritize challenges and work together on all aspects of joint activities (see graphics below). Membership on the U.S. CULCON Panel is comprised of nine private sector members with diverse expertise and three ex-officio government officials (Assistant Secretary of Education for Post-Secondary Education, U.S. Department of Education; Assistant Secretary of State for Educational and Cultural Affairs, U.S. Department of State; Assistant Secretary of State for East Asian and Pacific Affairs, U.S. Department of State.) The chair and vice chair of the Panel are private sector members. The Japan CULCON Panel (hyperlink to membership section) is similarly configured. 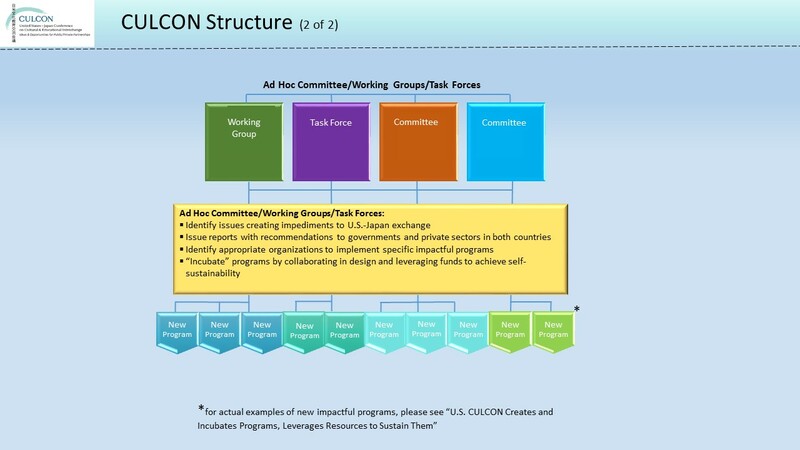 CULCON organizes joint ad hoc working groups*, whose members (consisting of CULCON members and private sector and government officials with related expertise) focus on specific impediments to exchange and/or best practices; and offer recommendations to stakeholders to address common challenges. A biannual plenary session brings together members of the U.S. CULCON Panel and the Japanese CULCON Panel, who identify emerging issues of importance to the U.S.-Japan relationship and explore ways to encourage people-to-people exchange. At the meetings, the Panels agree which issues to pursue over the coming two years, and determine whether to add or conclude working groups. CULCON Panels offer policy recommendations to the governments of Japan and the United States. Recommendations may also be directed to the private sector, including academic institutions and civil society organizations. Having made recommendations, CULCON identifies appropriate organizations to implement recommendations that will make the highest impact into innovative programs. CULCON may collaborate in the design of a new program in response to policy recommendations and help leverage funds to make it self-sustaining. In addition to working in concert, the U.S. and Japanese CULCON Panels pursue their own objectives independently. Working together and independently, CULCON is a high-level, dynamic organization that has identified timely issues and responded with a range of creative solutions. The solutions are a direct result of the gatherings and discussions of CULCON’s unique grouping of public and private sector members and the engagement of its panelists. Download a PDF of the infographics here. 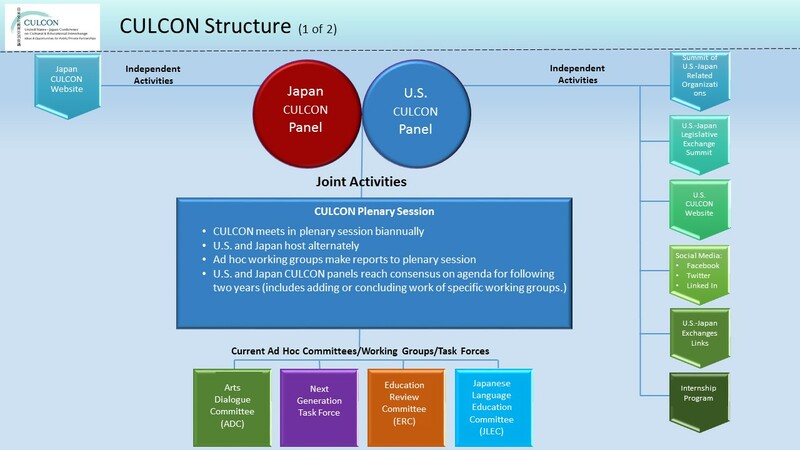 CULCON’s strategy for creating real and lasting advances in the U.S.-Japan relationship is to identify challenge, examine it in-depth, raise awareness of the issue, make recommendations, and then seek an appropriate organization capable of implementing the recommendation that will have the most impact in an innovative way. 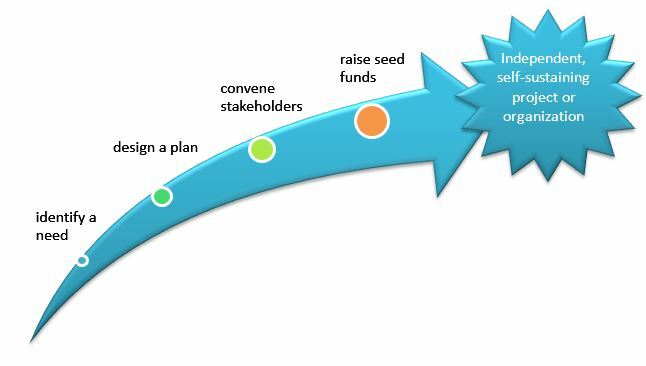 Active in shaping a new program, CULCON may act as an incubator before a program can reach self-sustainability. Serving as an incubator for ideas, CULCON is able to leverage its limited resources to promote U.S. interests through bilateral educational and cultural exchange. Education Review Committee (ERC) monitors changes and new efforts to achieve the CULCON goal of doubling U.S.-Japan student mobility, set by the CULCON Education Task Force in 2013. Japanese Language Education Committee (JLEC) assesses the efficacy and availability of Japanese language education in the United States. Arts Dialogue Committee (ADC) addresses a range of issues relating to arts exchange including cultivation of the next generation of arts professionals. Next Generation Task Force, examines new areas of opportunities to engage a next generation of U.S.-Japan leaders and considers recommendations for the U.S. and Japanese public and private sector leaders on how best to support the development of a next generation of U.S.-Japan experts.